Waterfront Concerts & Scarborough Downs: Happy Together? Waterfront Concerts recently announced they have expanded with a new franchise in Scarborough Downs called "Music at the Track." Though only a handful of acts have been scheduled thus far, if all goes well, the new venue could expand to as many as 12-15 shows in the future with headline acts alternating between the Bangor and Scarborough locations year to year. 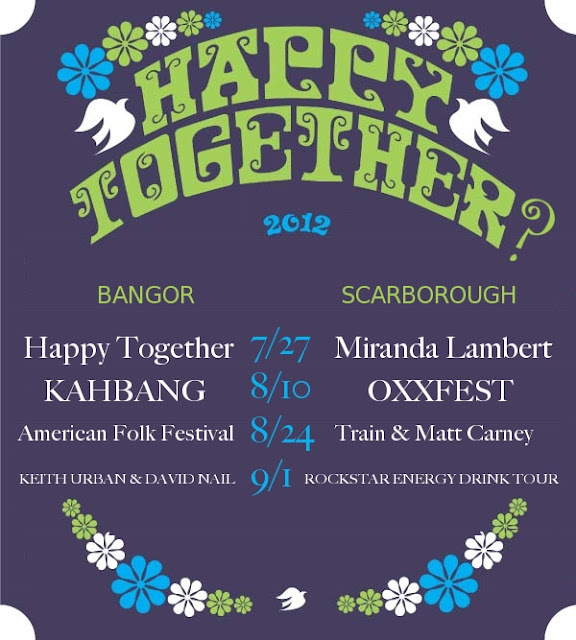 But, before you buy tickets to one of the southern Maine shows, you might want to make sure you're not missing anything at KahBang, The American Folk Festival or the Bangor Waterfront Pavilion. See "Happy Together" cheat sheet above.